If you already have a Goode & Fresh Pizza Bakery gift card and would like to check your balance please follow the link below. 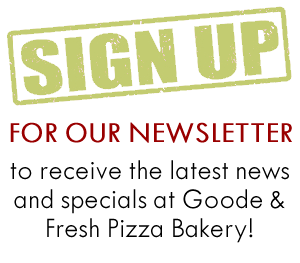 The Goode & Fresh Pizza Bakery gift card is the perfect choice for that someone special. You may purchase gift cards in any denomination at our store. So whatever your occasion or holiday may be, let the Pizza Bakery help you make it GREAT! For more information, contact us at (847) 724-0520 for additional information.